Sandra is authentic and eloquent as she shares her experiences with infertility. Today, she shares “The Untold Truths about Infertility,” including Ovary Hyperstimulation Syndrome (OHSS), multiple unsuccessful frozen embryo transfers (FET), the need to advocate/research, and the importance of letting go. I found myself nodding along in agreement throughout the entire thing. Sandra and I connected on Instagram through our infertility accounts, and I instantly knew I liked her. The rawness of her Instagram posts following multiple unsuccessful frozen embryo transfers was soul-fueling for me. I just wish Sandra didn’t live all the way in Canada - otherwise I just know we’d be connecting in real life, finding solidarity in our infertility struggles. Please help me welcome the lovely Sandra to the Unicorn Community! Sandra and her husband, Jason. I’ve recently heard people praising celebrities for publicly speaking about their fertility struggles and their unconventional conception method, namely through IVF, surrogate or adoption. I can’t help but cringe. Not because I don’t support these celebrities, but most of them only admit to their fertility struggles once they’ve had a successful outcome. What about being open about our fertility struggles during the process rather than only once we’ve reached our desired outcome? Truth is, not all fertility stories have a happy ending and the lack of transparency leaves many of us often battling mental and physical issues, during one of the most taxing processes of our lives. 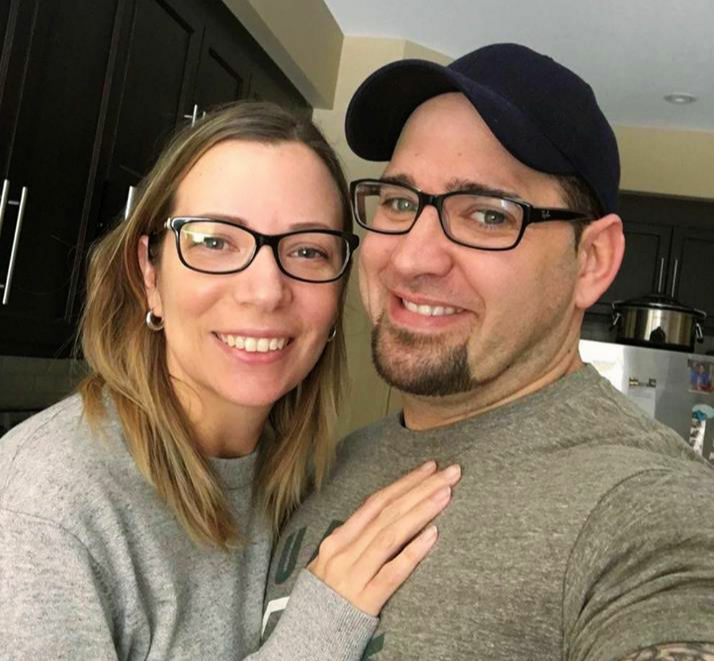 So, I made it my mission to be completely transparent about my husband Jason and my fertility journey, whatever the outcome may be because I want other women and couples to find comfort in knowing they are not alone. Jason and I have been trying to conceive naturally since 2014 and with the help of assisted reproduction since 2016. In March 2016, I suffered what we believe was a very early miscarriage. In 2017, after trying to get pregnant for two years with no successful outcome, we were referred to our local fertility centre to get assessed. After many medical exams, we were diagnosed with unexplained infertility. In short, both my husband and I are fertile independently and there is no medical or scientific cause to explain why we can’t get pregnant. This is very hard for people to grasp. Believe me, I know! I’ve been told to go on a trip, get massages, change my diet and try all types of gadgets but truth is, it is far more complex than you would believe. It involves genetics and a whole lot of combined health issues, and that is why it should be left to the pros! After a failed IUI in 2017, we thought for sure IVF would be the answer to our mysterious fertility problem. We naively and blindly walked into the IVF universe in 2018 with high expectations and very little knowledge. The medication doses were much higher, the side effects more aggressive and the process more complex than anticipated. I was not prepared for the tsunami effects of the hormones on my mental and physical health; the emotional meltdowns, the swelling from water retention, the hair loss, the burning sensation at the injection sites, the bruises and the anxiety that comes with every needle. It was difficult, so much so that I would not repeat it ever again. Sandra and her husband, Jason, at their first frozen embryo transfer. After fifteen days of ovarian stimulation injections, my stomach was sensitive, filled with fluid and stretched out to its maximum. The doctor assured me that the egg retrieval procedure would be painless and that I’d be back to work the next day. The doctor retrieved 42 eggs and the procedure was excruciatingly painful for me. I missed over one week of work to recover from light Ovary Hyperstimulation Syndrome (OHSS). I remember vaguely being told that this was a possible scenario but didn’t imagine it could happen to me. A few days following our egg retrieval, I learned that our seven fertilized embryos had been frozen and our embryo transfer was postponed. I was crushed. Our doctor initially told us that we would have to wait five months until our first embryo transfer. I later learned through an online forum and other women that additional funding had been allocated to our centre. I advocated for our transfer to occur sooner and managed to schedule it in February 2018. Had I not called (read harassed) the centre, they would have kept us waiting until the Spring. Our first embryo transfer was performed without a glitch. During the two weeks leading up to our pregnancy blood test, I experienced heavy dizziness. I was sent to get assessed at the nearest hospital emergency room. The ER staff came to the conclusion that I was probably dehydrated. The next day, our fertility centre confirmed our pregnancy hormone level wasn’t rising at the normal rate, our gestational sac measured seven weeks but our embryo was nowhere to be seen and probably dead. We were presented with three options to miscarry, and we chose to take pills at home. It was one of the most traumatizing experience of my life. We later found out through our research that our embryo could have implanted later and developed a heartbeat on week 8 or 9. We also learned that we could have requested genetic testing of our embryos prior to freezing to rule out genetic anomalies and only transfer the highest quality embryos. Our fertility centre never presented us with these options. It is disheartening to think that in the midst of the most challenging time of our lives, we are expected to learn about human anatomy and all things fertility-pregnancy-related in order to advocate and to receive the best patient care. Sandra and her husband, Jason, at their second frozen embryo transfer. Another difficult part of this journey is to let go of the things that are out of my control. Every step in the fertility process can change at any moment because it all depends on my body’s reaction and consequently requires a lot of patience. I have to admit that it is pure torture because I continually have to wait for: the embryo to implant, hormone levels to rise, blood work appointment to be confirmed, test results to come in, calls to be returned, the right day to do the home pregnancy test, the pregnancy to be confirmed, the pregnancy symptoms to manifest, etc. I am entirely at the mercy of my body and there is very little I can do to control it. I now know that trying to do so will only cause more stress. We proceeded with three additional embryo transfers between July and December 2018. Two of them failed to implant and the last one ended in a chemical pregnancy. We spent most of the year googling everything, from symptoms, to medical processes and other clinics regulations. The outcome of every transfer really depends on my body’s reaction to treatment, hormones and my body’s receptivity of the embryo. My body will definitely not respond the same as another woman’s body and while it might seem logic, I sometimes slip into irrationality and get lost in the plenitude of online miracle solutions such as supplements, Chinese medicine, diets, books, Old Wives’ tales, and it quickly becomes overwhelming. Your sister or friend’s sister’s miracle pill, or diet, might have worked for her, but will not necessarily work for me. It is important to remember that this journey is my own. We quickly learned that google wouldn’t teach us to navigate painful emotions like grief, sadness, envy, anger, disappointments, frustrations and deceptions. Let’s just say the World Wide Web is not filled with medical advice on how to handle a chemical pregnancy or step by step guides on miscarriage. I’ve had to reach out to other women and do my research but most of the time, I’ve learned only by going through the motions, one step at a time. I also speak with a psychotherapist on a monthly basis to help me manage my emotions and she reiterates that the only way to move past it is to move through it. Yoga, meditation and honest communication have been my saviours. Sandra and her husband, Jason, at their third frozen embryo transfer. While we knew infertility was not a popular conversation topic, we didn’t expect our family and friends to “give us space” that we never asked for and to avoid the topic altogether. Some people decide for us without asking how we feel, whether it is a baby shower or a child's birthday party, they choose not to invite us to avoid their own discomfort. I understand that it is hard for others to comfort their loved ones when they feel helpless, but the lack of physical support made for a very isolating and lonely place. Luckily, I found an online community which motivated me to create our Instagram and Facebook account to share our story, create awareness and educate others. I’ve also had many acquaintances and strangers reach out to me to find comfort. These channels have allowed me to chat with women from all over the world and we both found comfort in knowing that we weren’t alone in our suffering. We’ve now reached the fifth year of our fertility journey. Never in a million years did we think we’d still be trying to figure this out 5 years down the road. It’s been quite the roller coaster. This process and journey haven’t been easy and have brought its fair load of challenges our way, but it has changed us forever, and we like to think that it made us better human beings and solidified our marriage. We’ve often heard friends and family label us as resilient, strong, courageous or brave, but I don’t believe we are stronger, more resilient nor more courageous than any of you. We simply have hope, and that is what keeps us hanging on and moving forward. That’s why we keep getting back up, why we keep the dialogue open and why we accept to be vulnerable with you. We will proceed with the next three embryo transfers at some point this year and we may not get the expected outcome, but will still have hope! For now, we are gifting ourselves with time and space for a few months. Time to reflect, to heal, to find balance and to feel joy again; space to connect with each other and with our essence. Subscribe below to receive occasional emails about Unicorn happenings!